The art world loves to get trashy. We're talking about rubbish, of course. There are famous artists who have used trash in their work and others who make garbage the work itself. U.K. artist Andrew Vickers created the papier-mâché sculpture Paperboy, which was recently on view at the Sheffield S1 Artspace in the Heroes exhibition. It's your average papier-mâché figure, clearly built to resemble a superhero (dig those hulking trapezius muscles), but it's composed from comic books Vickers said he found in the trash. There's just one problem with the artwork, discovered by comic book junkie Steve Eyre, who happens to own the World of Superheroes comic shop in Sheffield. Eyre's keen eye discovered that the pages pasted to the statue's leg were from a first edition of The Avengers, worth upwards of $30,000. 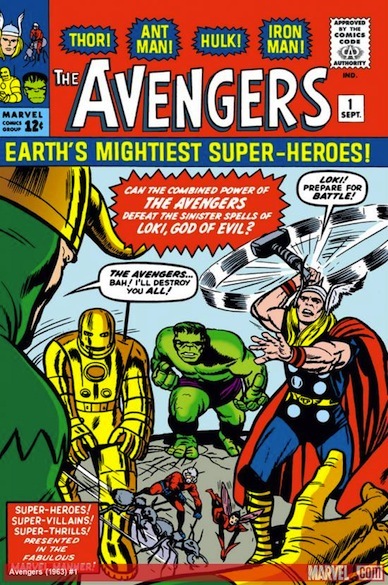 Marvel issued the comic, in which Loki acts like his usual jerky self, in 1963 from Stan Lee and Jack Kirby. Vickers basically laughed off the fact that he wasted an uber valuable comic book on his mediocre sculpture. "I really love the idea of me creating something out of such expensive things that's worth less. I think it's brilliant," he said. No, no it's not. Someone shake some sense into this man. We'd be sobbing right now. The BBC has photos of Vickers' biggest life mistake ever if you want to see what a waste he made of the precious comic book. Otherwise, feel free to vent in the comments.